Hiwan Hills in all its glory! 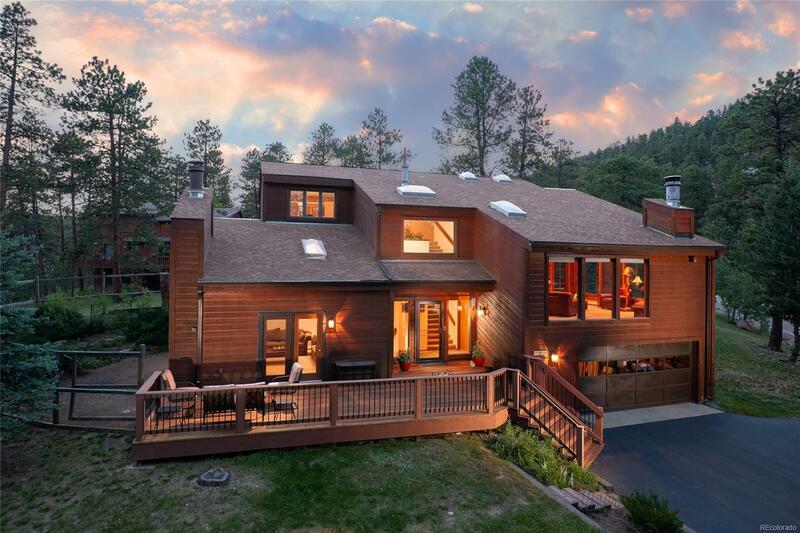 Mountain Contemporary, meticulously maintained & wonderfully kept-this home is ready for you. Recently refinished decks on both sides of the home make for wonderful outdoor living while the large-full height windows & skylights bring the beautiful setting in along with terrific natural light. An ideal layout with dramatic tongue & groove vaulted ceilings in the Family room complete w/extensive built ins & even a wet bar--anchoring the room is a large scale stone fireplace w/a perfect hearth to gather on. It's open to the kitchen w/expansive counter top spaces, & downdraft cooktop on the island. Double ovens & thoughtful design w/generous cabinetry make for a convenient work space open to the eating nook & just down the hall from a formal dining room. The master has a private deck & 5 piece bath. Representing a terrific value for this condition and this location! The recently refinished driveway is butter smooth and very gentle grade. An easy win!